Product Description The new Ai SolventVap 20L series rotary evaporator comes with all PTFE valves for solvent-resistant operations. Also available are vertical glassware and digital temperature/rotation control. The optimized bath volume allows for rapid heat-up times. The condenser unit has specially designed glass tubes that utilize surface area extremely efficiently to allow the SolventVap evaporators to consistently deliver reliable and reproducible process results that are usually reserved for more costly systems. Additional features of the SolventVap are safety features, which includes dry-run protection, water bath over-temperature shut-off protection, and fuse protection. This rotary evaporator features a specially designed motor and worm gear, which provides constant rotation at speeds from 10 to 130 rpm. As the flask containing the solvent is rotated, it continually transfers a thin layer of liquid over the entire inner surface. This gives a very large surface area for evaporation, which is caused by the gentle heating from the water bath. The rotating system is fitted with a special seal that allows the apparatus to be placed under vacuum, effectively reducing the boiling point of the solvents and removing the vapor phase, making the process much more efficient. Each unit is also equipped with an easy-to-use vacuum release and a continuous feed system, which allows solvent to be constantly drawn into the rotating flask without needing to stop the operation. The digital water bath operates from ambient temperature to 99°C (210°F) with PID temperature control stepping at 0.1°C increments. Heating coils are located directly inside the pan for the most efficient heating possible. A built-in overheat protector will shut down power, should the controller fail. The standard glassware set includes 5.28 gallon (20 liters) round-bottomed evaporating flask, 2.64 gallon (10 liters) round-bottomed receiving flask, and vertical condenser. 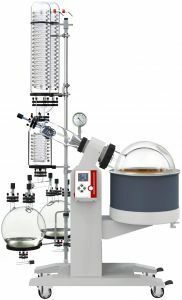 Rotary evaporators with a vertical glass condenser for are great for distillation of solvents with higher boiling points. Standard with a custom made stainless steel 20L evaporating flask carrier with silicone cushions. This carrier can be placed on top of our 20L SolventVap's water bath for easy loading and unloading. It can also be used as a flask stand.